Julia's granddaughter gives a thumbs up on new designs. Peek-A-Boo Pillows® are unique, adorable pillows invented by Julia Faircloth (aka Julie in 2002, owner of Purple Cow Creations in Newberg, Oregon. 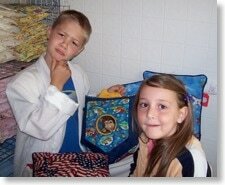 The idea of a pillow with a door covering a cavity all started with a dream by Julia. While working on an order of typical pillows she became inspired about the idea of a pillow that had something hiding inside. 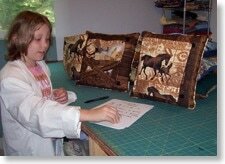 After a night of dreaming how to construct the pillow, the next day she made a prototype and really like the concept. Next, Julia made up several more Peek-A-Boo Pillows® and sent them off to Bozeman, Montana to be sold in her sister's store, The Artshoppe. These origial pillows were an immediate hit. 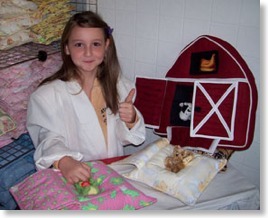 When Julia received her first reorder for the unique pillows she soon realized she was in the Peek-A-Boo Pillows® business. Soon thereafter Julia obtained a federal registered trademark on the name "Peek-A-Boo Pillows® and applied for patents covering the invention. As the product was seen by more retailers and individuals the orders started coming in. The product is sold in the following ways: company website, etsy, retail stores and at holiday markets during Christmas season. Bryan and Julie, both valuable team members consult over new designs. 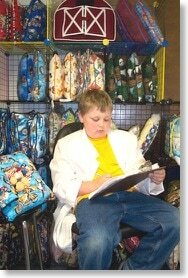 Our pillows are made for children and adults alike therefore we employ the strictest quality control and creative minds to approve of all new styles introduced. Over the years Julia has the help from young design engineers (grandchildren), who have the final say on any new pillow introduced. If they do not approve of the new design, in anyway, we start over until we have a "winner". 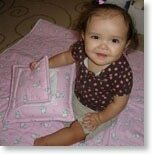 After all, Peek-a-Boo Pillows® are made for children, and they should be approved by children. In addition to the tough scrutiny of our "design engineers” we also carefully inspect our pillows through various stages of the assembly. We want our customers to be completely satisfied with their purchase. Alex documents her quality control approval. Jake, a quality control expert. aproves a new design. Vianca demonstrates how to play with her pillow. 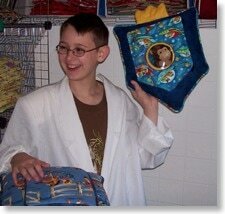 Joe is deciding how to market this particular pillow. Joe, the production engineer takes a break after crunching numbers. Alex, an expert on all things cute, checks the functionality of the pillow door.